Everyone needs to sweat, yet some people experience excessive sweating in areas such as the hands, feet or armpits (Hyperhidrosis). This is caused by over-active sweat glands and can be embarrassing. 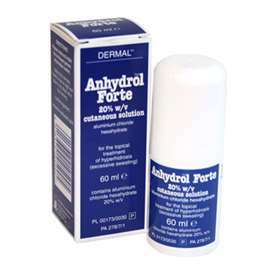 Anhydrol Forte is an effective medication used to combat excessive sweating. The application routine causes fluid to build up in the sweat glands, eventually shutting them down and allowing a more normal sweat flow. Clear, colourless evaporative solution containing: Aluminium chloride hexahydrate 20% w/v. Apply when necessary at night and allow to dry. Wash off in the morning.